Restorative Dentist in Downtown Washington, D.C. When your smile isn’t at its best, it can be a burden on your eating habits, your confidence, and your day-to-day quality of life. Thankfully, restorative dentistry is the perfect tool for rebuilding dental structure in durable, attractive, and long-lasting ways. As a prosthodontist, Dr. Davidson specializes in this type of quality rehabilitation, and she looks forward to helping you regain complete, natural-looking teeth that can be wholeheartedly relied on. Please contact us today here in Washington, D.C. to schedule your first consultation. Custom-made restorations like dental crowns and bridges may be recommended for several reasons, such as to rebuild damaged enamel, to correct significant cosmetic imperfections, or to recreate an entire lost tooth. Our team will always use high-quality materials and ensure the ideal fit for each patient’s new smile addition, taking their personal preferences and goals into account. With tooth-colored fillings, our dentists are capable of correcting the damage caused by cavities in a simple and virtually seamless manner. We will use composite resin, which comes in a variety of lifelike shades that can be closely matched to your existing enamel. 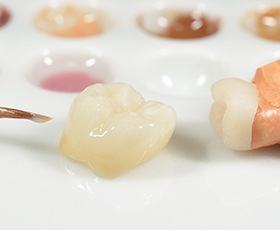 After sculpting the material into place and hardening it with a curing light, it should be difficult for patients to distinguish the finished result from the rest of their natural teeth. This type of filling is also less sensitive to temperature changes than traditional amalgam and more conservative as well. Dentures have been around for hundreds of years, and these reliable prosthetics have become more modern, more comfortable, and more lifelike than ever before. 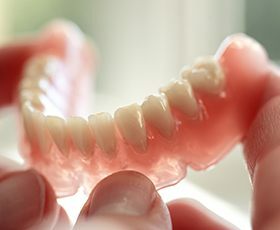 At Davidson Dental Associates, we offer several versions of dentures so that patients can recover from significant tooth loss in their desired fashion, including traditional (removable) full and partial models and implant-retained prosthetics. Dr. Davidson strongly recommends the latter in most cases because of the added oral health benefits and greatly improved permanency. 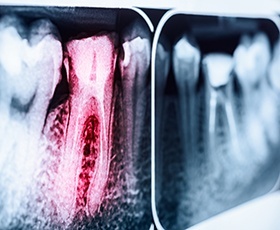 When a severe infection threatens your natural tooth and causes significant pain, extraction may seem like a foregone conclusion. Thankfully, our endodontic specialist Dr. Sallen can perform a root canal to treat and preserve the tooth instead. During this procedure, we will access the tooth’s inner chamber and canals, removing diseased pulp and bacteria from within. A custom-made dental crown can then restore the tooth’s outer appearance and function as a finishing touch. 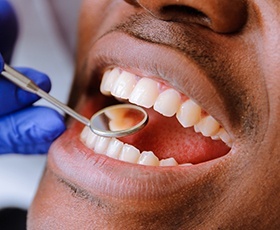 While the extraction of natural teeth will likely not be our team’s first recommendation for treatment, this service can become a necessity in dire circumstances. Thankfully, our specialists can make this process a smooth and comfortable one, and Dr. Davidson will also start working with you right away on reconstructing your complete smile (if applicable) so that you don’t have to spend time without a full set of teeth. When a tooth is badly injured and cannot be successfully restored. When a patient is suffering from advanced tooth decay and/or severe periodontal disease. When a patient is in need of orthodontic treatment and needs room created in the mouth to accommodate this process. 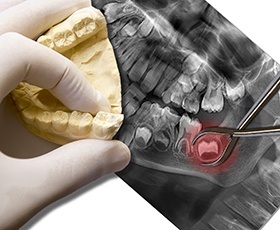 When a patient’s third molars (wisdom teeth) are impacted, overcrowded, or otherwise problematic and must be removed to preserve the patient’s ongoing oral health.